Wordzen takes individual privacy very seriously. We are also aware of the threats to your security and privacy on the Internet. Please take a few moments to review the steps that Wordzen takes to ensure your privacy and security while giving you the best possible customer service as you use our website. Cookies are small files placed on your hard drive by an Internet server when you visit a website. If you subscribe to Wordzen, your name and email address will be placed in a database. As with all other personal information, only employees of Wordzen have access to this data. We do not give Wordzen subscriber addresses to outside companies. Any email you send to Wordzen for drafting and editing is completely confidential. If you have any questions or concerns about confidentiality, or would more information, please take time to review our Confidentiality Policy. To use Wordzen, you must grant Wordzen OAuth access to your Gmail account. 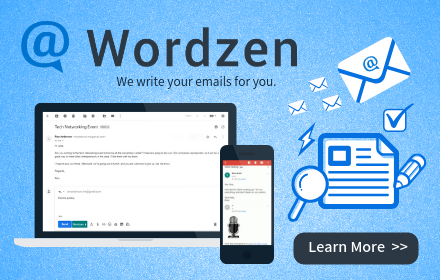 Wordzen uses this access to retrieve the contents of an email that you choose to submit for editing and to save the edited email back to your Gmail account. Only emails you submit to Wordzen are accessed by the OAuth credentials and viewed by an editor. For more information on what our editors can and can not view, please refer to our Confidentiality Policy. Wordzen has a strict policy against advertising our service by using unsolicited email messages. We require that all emails promoting wordzen.com or its products are sent only to clients who have agreed to receive such messages. We prohibit any advertising of our brand and website using unsolicited email messages. Not complying with this policy will cause partnership termination and/or affiliate account termination. If you feel you’ve been sent unsolicited emails promoting our brand or website and would like to register a complaint, please email contact@wordzen.com. We will immediately investigate all allegations made related to unsolicited messages. Great post about Wordzen's policy privacy. Online security is of the utmost important for businesses and Internet users.